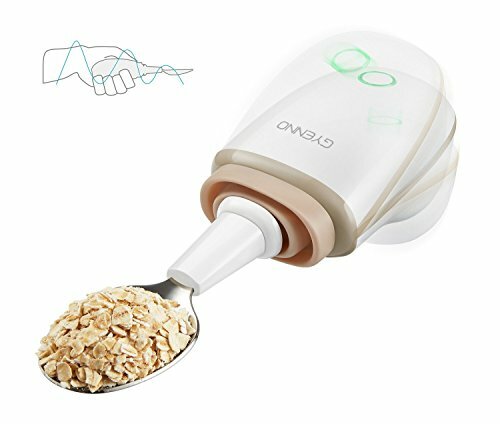 This spoon is an intelligent piece of tableware specially designed for patient suffering from hand tremor conditions to help them avoid awkwardness and inconvenience while eating. It can recognize and actively offset hand tremor to provide them an easier and more stable dining solution. Generally speaking, the spoon works effectively for people with a hand tremor amplitude of less than 7 cm. It provides limited benefits if your tremor amplitude is out of this range. Medical grade silicones , anti-bacterial, ensure a safe eating experience, Switch on and off automatically. Automatically turn to sleeping mode when you stop using significantly reduce power consumption. Ergonomic design, the design adapted to the general hands use habit, easy-to-hold and prevent from slippery. 1. Cut a 7x7 cm square hole in the center of an A4 piece of paper. 2. Ask a friend to vertically hold the piece of paper with both hands. Take a pen and hold it in the center of the hole for 20 seconds, with your hand as close to the hole as possible. 3. Referring to the test videos below, observe and note the amplitude of your hand tremor. The spoon is perfect for you if the pen can be kept in the hole most of the time. 4.If the pen hits the paper, please consult us for further information. Safe material: Made from Medical grade materials, Mediacal grade silicones, anti-bacterial ensure a safe eating experience. Easy to use: Automatic mode use. Switch on and off automatically. Automatically turn to sleeping mode when you stop using. Significantly reduce power consumption. Comfortable: Excellent quality and suitable size. Ergonomic design, the design adapted to the general hands use habit, easy to hold and to prevent from slippery. Suitable: Fully charged battery can run three meals a day. The maximum use of time is 180 minutes. Replaceable battery designed. The Notification Light shows using/battery status. For all kinds of meals: Different utensil attachments designed for various food, easy to change. Having designed different utensil attachments for the user, which include an everyday spoon and a fork.